First impressions are everything, and your UenMe profile is no exception! UenMe is about connecting one to one, so let's see your favorite photo of you! You don't need a professional headshot, don't worry! But if you can snap a decent selfie or have a friend take a nice photo of you, you're in business! 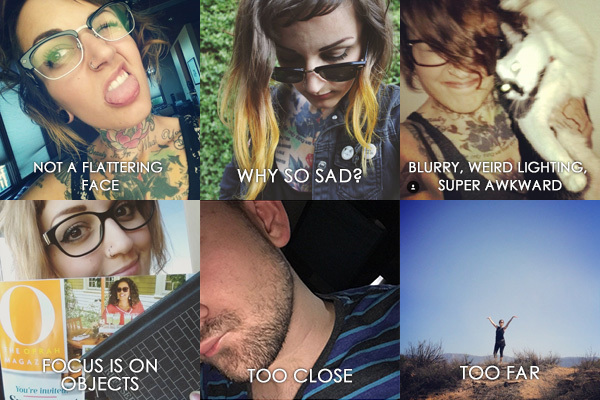 Here are some examples of awesome profile photos, from actual UenMe users! Here are a few experts on UenMe who have awesome profile content and pics! A bad photo will discourage other users from wanting to chat with you, but a photo that is not allowed on UenMe can get your account suspended or banned. Boo! Here are some examples of photos that don't work too well as profile photos. Some of these are from actual UenMe users, while others are from our Community Manager's Instagram. These photos would all technically be acceptable, but you can do better for your profile photo! 4. Not sure about your photo? If you're a bit shy and don't want to upload a glamour shot, that's okay, too! You can get creative with looking away from the camera or showing just a part of your face. It should be obvious that your photo is of you, though, since UenMe is all about connecting one to one with real people. Take a look around the app to get an idea of what other folks are uploading for their profile pics. If you're still not sure if a profile photo is acceptable, you can always check in with the UenMe Community Robot on the app. Just send a message to user @UenMe and a member of UenMe staff will help you out! Tap in the bottom right corner of the app to go to your dashboard, then scroll down to tap Edit Profile. Tap the blue camera icon to take or choose a new photo. Super easy, right? Chatting with a stranger can be intimidating if they're a total mystery, so make sure to choose an awesome profile pic to be your first introduction!